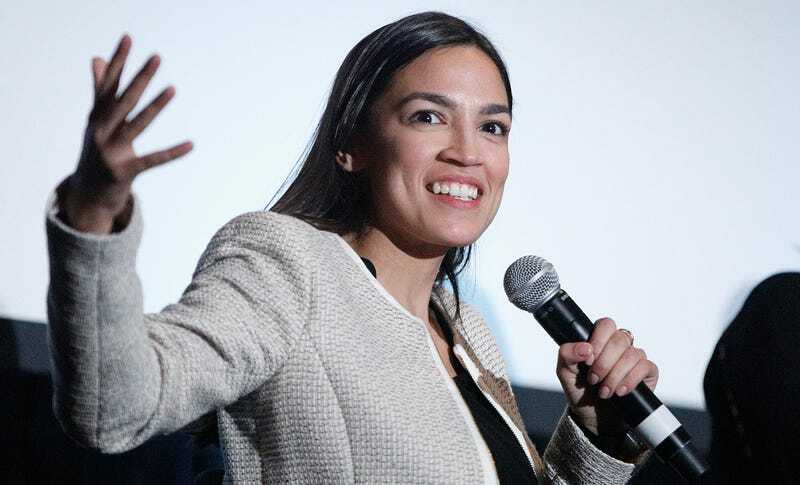 US Representative Alexandria Ocasio-Cortez on stage during the 2019 Athena Film Festival closing night film, ‘Knock Down the House’ at Barnard College on March 3, 2019 in New York City. File this under: Please make this happen. But if one member of Netflix’s hit series Queer Eye has anything to say about it, the freshman congresswoman may be giving her critics even more to talk about, thanks to a tweet from the show’s interior designer, Bobby Berk, who reached out to volunteer his services on Monday (h/t Vogue). On Tuesday, Ocasio-Cortez got the message—and invited Berk to “swing by [her] office” to address the “[bachelor] pad/warehouse type situation” going on there—including a rainbow Post-It wall? And this is where it gets really exciting, because Berk said he’d love to. At last glance, the two were moving the conversation to DM. We want AOC to get the same treatment—including a super-chic but under-budget wardrobe from Queer Eye stylist Tan France—if only because it’ll make a few right-wing heads explode (likely on the sheer gayness of it all, alone). Netflix, please, please, please make this happen; and then release it as a special, so we can all share in the joy. Maybe things just keep getting better, after all? There, they not only got a tour from the freshman firebrand, but met Speaker Nancy Pelosi and fellow congresswoman Pramila Jayapal (D-Wa. ), and did a little unofficial lobbying for the Equality Act.